Well I’ve finally recovered from my weekend away, one of the few remaining Bachelor Parties this old body may see for awhile. Regardless it was a blast! Before I left Astrogeology V was queued up, but I barely made a dent in it’s nearly 15 day training time. Since returning home I’ve switched it up a little. I’m finishing off Refining IV in a couple hours and then I’ll snag Veldspar Processing and Mining V so I can equip Modulated Strip Miner II’s. Then I’ll finish off the Astrogeology training as well as Mining Barge V so I can queue up my Exhumer skillbook and get into a Hulk mid-September. 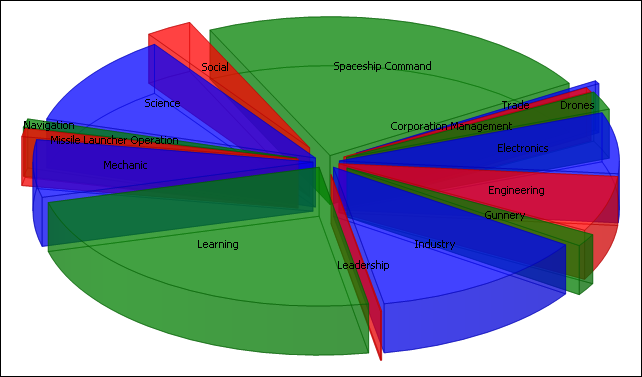 So that’s the skill training landscape I’ve setup for the foreseeable future. Once that was all lined up I set upon getting a new mining barge, the Retriever! At first I thought it wasn’t going to be much of an upgrade over my Osprey, boy was I wrong. That baby can tear through asteroids like they were made out of paper mache! Here is the fit I ended up with. I have been unable to fit an MLU (Mining Laser Upgrade: +5% yield), perhaps I can find some rigs or implants that will allow it. Now that I was pulling in roughly 17k units of Veldspar per mining cycle (180 seconds) I was filling my Giant Secure Containers (GSC) in roughly 2.25 cycles. I had asked earlier what people would suggest for a hauler. I got some good responses, but ultimately I’ve just kept my Caldari Badger II. It’s the cheapest Industrial hauler of all four races and when I was done fully fitting it I can haul 16,110 m3 of space, not too shabby! Here she is. I fitted 3 Expanded Cargohold II’s giving me just voer 12.5k m3, enough to fit 4 GSCs internally, adding an additional 3,600 m3. Previously I could only haul 2.75 GSC’s before my hauler was full so it was a pretty good upgrade to say the least. I even had to buy another GSC to anchor in space at my little asteroid belt I call home. I can fill up my 4 GSC’s in a little over 30 minutes, leaving me a good haul. Yesterday with this setup I was able to pull in roughly 3.5 million units of Tritanium, which sold for a good price in Jita. I’m finally starting to make some money, but I’m going to need every penny as those Hulk’s ain’t cheap! 28 million ISK for the Exhumer skillbook alone and around 100 mill or more for the ship. Ah well, at least it’s something to aim for! Finally! After over 7 days of training I’m finished with various random Learning skills, Mining Barge III & Astrogeology IV. Retriever here I come! For all of you out there thinking “7 days of training? This guy ain’t seen nothing yet! What a sucker”…well maybe. You have to start with baby steps before running and I’m happy with the progress I’ve made so far, be-it ever so small. My mining Osprey has been doing extremely well over the past week which was a pleasant surprise…I might even miss the old girl. “The Pelican” was stuffing giant secure containers like bell peppers, but alas all good things must end. Yet, as fate would have it, I’m leaving Dodge for yet another weekend away, thus my beloved strip mining Retriever will have to wait until next week. However, the other side of coin has blessed me with an abundance of play time next week, so I’ll be stripping like crazy and breaking in my new boat. According to EFT my ore yield will increase from 470 to 590, again in EFT’s mysterious “ore units”. (Can anyone explain those to me?) This should be a good jump, though I might have to invest in a few more GSC’s to cope. I believe I have enough capital to get my bird up and flying. I would like my next investment to be a good hauler. I wrote earlier on my newly upgraded Badger II and even though it was a great improvement, it just doesn’t quite have the cargo space I would like. I’m not sure what to set my expectations to, but ultimately I’d like to haul a full jet can in a single trip. That’s probably a ways out, but can anyone suggest a decent hauler for the time being? My dreams of flying a Hulk should be realized in early September. Until then, it looks like mining, mining and more mining. But so far so good, I’m not burned out and it’s actually suited my recent play time perfectly. Thanks again for all those that offered up much needed suggestions! And for all you asteroids out there, you better watch your back because your days are numbered! Ooh-rah! So this weekend I finally had a good chunk of time to spend in space. As I’ve rambled in the past I’m currently focused on mining. I had attempted a small dose of it early on, but now I really wanted to do nothing but mining and see how far it could take me. I’d fitted myself a nice Badger II hauler and a mining Osprey. I picked up three giant secure containers and found a great, quiet system to setup shop. My first few days last week I spent at a small asteroid belt close to home. The asteroids varied in quantity, the largest being about 25k units of ore. I stopped mining some of the more exotic ores to focus on the main cash cow in Jita: Veldspar. This weekend I decided to give a few other belts a look-see and when I arrived at the first new belt I was quite shocked. There were some HUGE rocks floating right in front of me! At first I thought my camera had zoomed extremely close in, but that wasn’t the case. These asteroids held roughly 100k units of ore, quadruple anything I’d seen previously! I was amazed, this would be so much more convenient. My Osprey was just newly fitted with some Miner II’s which produced around 4.5k units of Veldspar per cycle, plus my 3 Mining Drone I’s produced about 500 units per cycle. EFT reported I pulled about 470 ore units (whatever that means) per minute. One of these giant ‘roids would fill my 3 GSC’s and I’d start hauling, even though my Badger II, fitted with 3 Expanded Cargohold I’s, couldn’t fit the contents of all 3 GSC’s in a single trip. I found little trouble from any Pirates or can flippers, as the system I moved to is very quiet. The local channel fluxates between about 4 and 30 people depending upon the time of day, and most are miners flying Hulks. I did some skill planning in EVEMon to get myself into a mining Retriever. I finished up Industry V Sunday morning and had Astrogeology IV queued up, which would have finished this Thursday around 4 AM Pacific. However I also wanted to see how long it would take me to get into an Exhumer and eventually a Hulk. It was quite a ways out, August 13th and September 9th respectively. EVEMon suggested I train two remaining Advanced Learning skills to III: Focus & Clarity. With my newly fattened wallet I decided I pick those two skill books up (4.5 million ISK ea. ouch!) and get to training them. This has pushed back my completion of Astrogeology until this weekend sometime, but in the end I would shave 5 days of training of my Exhumers plan if I did the final Learning skills, so it’s a fair trade off. 2 days of training now for 5 days saved later, net 3 days. At times I will admit I was slightly bored doing the mining thing. It did keep me on my toes however when someone showed up at my belt, miner paranoia if you will. Regardless I did enjoy my time in space this weekend and I would like to continue down this path, at least for the next few weeks. I’m anxious to get my refining skills beefed up a little more and into a Hulk eventually. Hopefully you’re weekend in space was as enjoyable as mine! There isn’t much going on in the world of EVE for me at the moment, being a new, solo, non-corporation member. This is probably a good thing considering the amount of time it usually takes me to get a solid grasp of things. Regardless I still feel the urge to ramble on, so here we go again. I was intrigued by Kirith’s post about his current character’s skill distribution. I found it very interesting to see how 40 – 50 million skill points are typically spread out for a veteran player. In comparison, I figured I’d post my own skill chart. Freddy only has roughly 2.8 million SP, and most of the allocation has been compulsive (i.e. – only 2 hours for skill X? Sounds good!) but perhaps it’s still a good indicator of where a true EVE ‘newbie’ will find themselves after around 8 weeks in New Eden. This reminds me slightly of the “Places I’ve Been” meme that was going around a few weeks ago, though not quite as compelling. I can’t wait until tonight when I can actually start trying her out! The last couple nights have been fairly hectic at work and at home, so my EVE time is a little bit on the lighter side. Regardless, I’ve been able to get in space for a couple of hours here and there. As my previous posts have stated, I’m currently training Industry V which should finish this Sunday morning. Once that’s done I can finally train Mining Barges and pick up a Procurer to fit some Strip Miners, thus (hopefully) vastly increasing my yield. But that’s getting a little ahead of myself. With my shenanigans of attempting to run Level II missions in a Destroyer leaving me practically broke I needed a plan to get some capital for my Procurer. I had just enough money in the bank to pick up an Osprey Cruiser and fit it for mining. It’s a very basic setup, but I already had everything I needed from looting Gurista wrecks except a few Mining Drones. Thus the past two nights I’ve done nothing but mine, and I can see why some people say it can be pretty boring at times. My first experience with can flipping wasn’t too horrible as I barely lost anything, but regardless it taught me to play it a little safer. Most people say they rarely have a problem with can flippers, but I’m mining pretty close to Jita so the population is alot higher where I’m at and I guess ‘flipping is thus much more prevalent. So I decided to pick up 2 Giant Secure Containers to help keep my ore safe. Each GSC can hold 3,900 m3 of ore making me sorely miss my 27,500 m3 of jet can space. (Those jet cans are HUGE!) Anyways, it actually works out pretty well. I have a Badger I that can haul almost two full GSCs, and I plan to pick up a Badger II eventually that could easily haul both full containers. I transported my containers to a nice little belt nearby and anchored and password protected them along the far corner. I then came back in my Osprey and started sucking on the ‘roids. There are basically 3 main types of ore in the belt I’m at: Pyroxeres & Plagioclase plus all their variations. I found the market value to be around 30 ISK per unit, not great but better than nothing. So far I’ve mined around 2 million ISK worth, but I don’t know if it’s better to reprocess my ore and sell the results or just sell what I have. I’ve read in several places that it’s not worth it to reprocess until your skills are higher. My Industry skills are mostly around III and IV so I’ll probably just sit on the ore for now. Suggestions anyone? My current Osprey load out can be found here. I have a standard missile launcher for protection, along with 3 civilian shield boosters. I found that that wasn’t enough in some cases so I had to make a slight modification. The Osprey drone bay can hold 4 drones so I loaded it up with 3 Mining Drone I’s and a Hornet I. I can only control 3 at a time, however, so when trouble shows up, I bring in one of my mining drones and launch my hornet. Works great. So even though I’ve had a few slow nights mining seems to be rubbing off on me. I can’t wait to get my Mining Barge this weekend and hopefully an Exhumer by next Thursday or so. Now if I could find some more valuable ore to mine…thoughts anyone? Rage Quit…the best EVE experience yet! When I finally got home the other night, there was alot to do. All the days away meant plenty of time spent un-packing, doing laundry, cleaning up, etc. etc. I was able to knock most of the chores out in short order so that left me with a few hours to spend in New Eden. 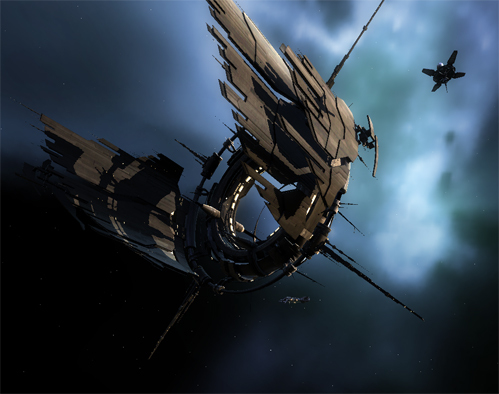 Before I left I had put Caldari Frigates V in the training queue and when I logged on I had just over 4.5 days to go. I had chosen that skill simply because it was the only one that I could train continuously the entire time I was gone, not necessarily because it was the best one to train. Either way, now that I was home and even though I was almost done with it, I decided to switch training to a few other shorter skills, like Industry V, Science V and a few Weapons Upgrade skills. Even if I had complete Frigates V, I still would have weeks of training before I could ever fly one of the unlocked ships, like the Flycatcher, not including the weeks spent trying to make the money to even buy one. I used to spend the majority of my time in EVE planning my skill queue. It was great to queue up 15 skills for the night and it gave me lots to work out in my spreed-sheets. Yet now that the majority of my skills take upwards of 2 to 7 days to complete I’ve been having more time to actually get out there in space. Case in point, my first night back I decided to get some mission running in. So I undocked and travelled to a nearby station that has my one and only Level II agent. I’ve run a couple missions for her before, but they’ve all been courier type missions, not too exciting. Well not tonight! Turns out she needed help riding a local trading gate of a pirate infestation. No problem I thought, little did I know that I was in for the longest, most frustrating EVE experience I’ve ever had…hands down. As I get to the gate I encounter a fair number of Pirate Frigates, definitely more difficult than anything I’ve encountered in the past simply because there were so many. It didn’t have too much trouble dispatching them though in my little Caldari Cormorant Destroyer. However, after 5 waves I was in trouble as a few Cruiser class Pirates spawned. I immediately noticed these large red crosses on my Overview. I’m quite used to the smaller ones, so I figured this one would be tough. It took me a good hour or more, but I was able to pick off a couple Pirates at a time, then warp away for repairs, thus saving the Cruiser for last. When he finally popped I felt pretty good, yet the final wave was about to hand it to me big time. The sixth and final wave was very similar to the first. It had the same cruiser spawn, yet this one was firing large missile at me from 75km+ away doing significant damage. I tried the same strategy, picking off one or two pirates at a time and then warp away, and it worked initially but I was just taking too much damage to sustain any real assult. Yet that wasn’t the truly frustrating part. Near the giant warp gate that I was defending was an enormous asteroid, I didn’t think anything of it really until I began flying too close to it. I attempted to align to a celestial object and ‘warp to within 0km’ and my ship started to spin in space with it’s speed indicator stuck near 20m/s yet indicating that I was in warp. I was taking heavy damage so I tried again. Nothing. I frantically started pressing every hotkey I could and trying to change direction, anything to get me moving again…nothing. My ship was stuck in a state of warp, but wasn’t moving. My poor little ship eventually popped and there I was in my pod. Frustrated that I lost my ship to a stupid rock, but more angered that such a fluke occurred. Oh well, it happens I guess. Off I went to purchase another ship and try again. I was finally all setup and ready for round two about 30 minutes later. When I warped to within 70km of the site I headed for my old wreck, hoping to salvage anything I could. I got about 30km away from the can when my ship started the wicked spinning again. “Seriously?” I thought, I immediately tried turning around. Nope, I was stuck again. Pop. Ship number two was gone in less than a minute. At this point I was fuming. How could such a problem exist in a quality product like EVE? I mean, after 6+ years could they not have handled Large Collidable Objects better? Ugh, I calmed myself down and started the process of re-equipping another ship. I was starting to get a little worried because I’m running low on funds currently and even though these frigates are cheap, 700k ISK for me is a big hit. After another 30 minutes, I was back. This time I was going to avoid the big rock at all costs. 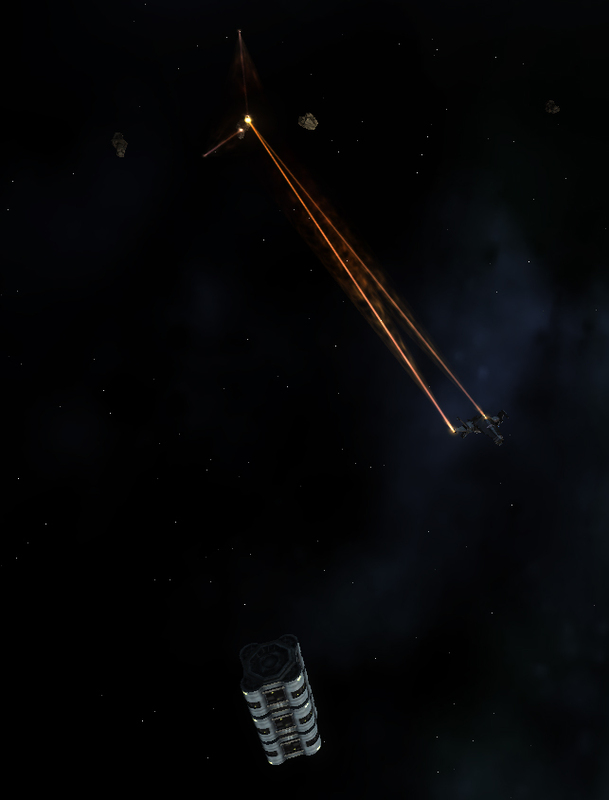 Earlier I had set a bookmark to a random floating beacon near the old warp gate, so this time I warped in to that spot. Apparently while I was away my Pirate friends had congregated around this little area, they seemed to know I was coming back. No sooner than 10 seconds after I had warped in I was heading back in my pod AGAIN. Seriously, there has to be something fundamentally wrong here. There’s a difference between a stupid mistake that deserves a facepalm and one where no matter how hard you try you still fail regardless. Now, I know I’m a severe newb, and I know things can get complicated in EVE, but there had to be something that I could have done to make this less painful. Was my ship fit completely wrong? Where my skills not up to par? Was I simply in over my head even though I was able to handle all 5 previous waves with no problem? WTF was wrong?!?! ARGH!! To make a long story a little shorter I ended up losing another 2 ships that night (one to the giant asteroid again) before calling it quits. I had laid my head on my keyboard a few times, shaking in my chair. I said the words “I’m cancelling my subscription to this stupid game!” a few times in my head. This whole experience was something I’ve only ever had a few times before. Then I remembered the term “Rage Quit”, and immediately knew exactly what they were talking about. Granted this was something extremely trivial, nothing like some of the epic failures we’ve all read about before, but it was no less frustrating. I’m sure a number of you are thinking ‘Damn, if this guy can’t handle a simple Level II mission he needs to go back to Free Realms!’, but ultimately, looking back, I’m glad I had this experience. I was so frustrated and assumed I was doing something so utterly wrong that I started doing alot of research on ship fits and resistance modifiers and rigs, etc. etc. I finally fired up EFT and began using it properly. I finally understood the differences between ships and attacks. I tried probably a dozen new items and skills. I started using ECM jammers and began looking very closely at ammunition types and the differences between them. I used long range missiles and skill augmenters. It was like a flood of knowledge all at once. 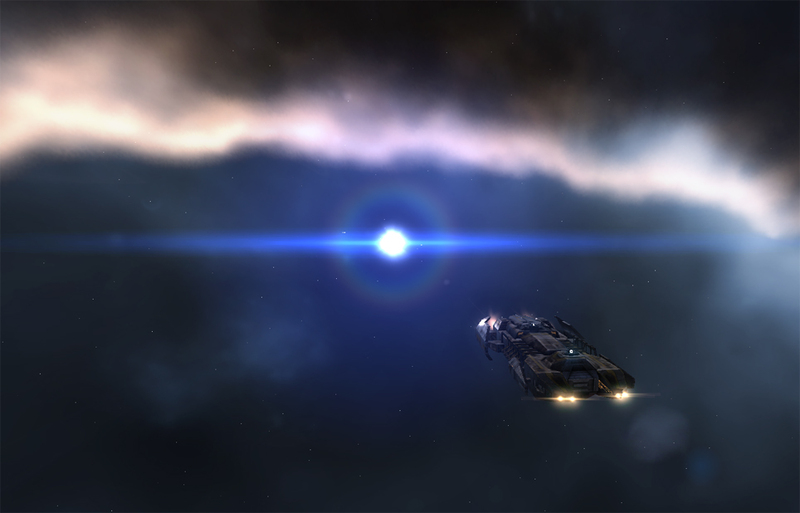 The night became the single, most impactful EVE experience I’ve ever had, bar-none, good and bad. I had read about other new EVE players relating similar stories, but I just didn’t “get it”. The things I discovered first hand were all probably glossed over by me previously in reading some of the new player guides out there. As they say “It only takes once” I guess. After being almost ready to quit the game I couldn’t have been more excited to keep playing! One of my initial impressions was that I was using the wrong ship, clearly I was on the border of utter failure, but my Cormorant seemed to be getting the job done. So part of my research was looking at new ships. Clearly I needed to elevate to Cruisers and I was appropriately trained to do so, but I simple couldn’t afford one, so I just had to make do. I spent the rest of the night mining away to my hearts content. Being that the Osprey has a drone bay, something mostly unfamiliar to me before since no ship other than the Caldari Bantam has had room for drones, I was able to fit some mining drones in for good measure even though I can only fly 3 at once currently. I have to admit they are pretty fun. Since this was a night of “firsts” for me I wasn’t totally surprised by what happened next, my first ‘can flip’. For those unaware, when mining in high-sec you typically pump the ore in your hull to a jet can floating in space since they hold a huge amount, many times more than most cargo holds. Unfortunately, they are totally unsecure and anyone can fly by, open the can up, and take what’s inside. This is what’s refered to as “can flipping”. So there I was, mining my own business, when someone warped into the asteroid belt. I didn’t think too much of it at first, but when I saw them heading straight for me I knew something was up. I quickly warped off to home base to pick up my hauler to get my ore that I’d spent a good 30 minutes on. When I got back the person was still there but they were now bright red in color (I assume from opening my can?). I arrived just in time to see him warp off. He had renamed my can ‘Thanks for the ore!’ so I figured I was out of around 20k m3 of ore. When I got to the can and opened it I was only missing about 4k m3, he must not have had space for the full load. Regardless, I was a little surprised when it gave me an aggression timer for opening and emptying my own jet can! Oh well, I was able to get back to my station without further incident. At least now I can say someone has flipped me off in space. It seems new EVE experiences come in bunches. I can’t wait until this Sunday when I will finally finish training Industry V and be able to fly mining barges. Hopefully by then I’ll have mined enough to afford one, time will tell. And in case you were wondering. I was able to finish that Level II mission in my Cormorant. I flew back in as soon as I logged on that night and cleared all six waves with not too much effort. In the end I lost probably 3 million ISK, but I see that now as money well spent! Well I finally made it back from the tropics. It was an amazing time with all the sun, sand & tropical drinks I could take! Great re-charger. Now I’m back in the real world again and should be back to more ramblings.